“Yeah, I know, but look at the map.” I show him my phone. We have apparently arrived at our destination, which, if it weren’t for the festive glow from thousands of tiny decorative lights coming through the windows, would look just like any of the other anonymous business park buildings sprinkled throughout the Maple Lawn development in Fulton. We’re definitely here, but there’s also definitely no sign. I have a flashback of arriving at a pretentious sushi restaurant in Brooklyn about a decade ago — there wasn’t a sign then, either. There was barely a door. You had to know what you were looking for, like the girl in Labyrinth. There’s definitely a door at Ananda. There’s also an ample outdoor seating area, complete with cushioned lounge benches and a long gas-powered fire pit. We enter the restaurant and see a dining area to our right, decorated in lush fabrics and white tablecloths. To our left is the hostess stand and bar area. It’s pretty busy for five o’clock — but then I remember that Ananda hosts a “bliss hour” every day from 4 – 6, so the crowd makes sense. We risked it by not making a reservation. Luckily, we’re immediately seated in a beautiful courtyard-like area, already decorated for the holiday season with garland and oversized wreaths. Looking at the “walls,” I can see that they’re the kind that could be retracted to open up the entire room to the outside. I make a mental note to consider this place for my springtime book launch party. Once I write a book, that is. We’re immediately impressed by the service staff. We realize that in our area alone there are two or three servers, as well as two floaters who are constantly surveying the dining area so they can swoop in to refresh water, clear plates, etc. The manager walks through the dining area several times as well, but the staff’s presence isn’t overbearing — it’s comforting. After perusing the cocktail menu, we both settle on bourbon-based beverages. I order the shrub cocktail: bourbon, honeycrisp apple, and ginger. It’s delicious, and I love the presentation with the thin slices of apple. I like when my cocktail smells as good as it tastes. Shrub Cocktail at Ananda - Bourbon, honeycrisp apple, and ginger. We start off with a couple of small plates: the roasted figs and ragda tikkis. We order the sea salt and rosemary naan as well. The figs are also presented beautifully, whole on the plate and skewered together with what I can only imagine is a “fig twig” (that’s really fun to say, even before the cocktails have kicked in) and topped with a tamarind-balsamic reduction, a quenelle of cumin ricotta and almonds on the side. The flavor doesn’t quite live up to the spectacle, however — it’s rather one-noted with sweet figs meeting sweet glaze. The ricotta doesn’t cut through that note well enough. The ragda tikkis — crisp patties made of potato, pea, and spinach and served over chickpeas with a tamarind and date chutney — are delightfully crisp, and the chickpeas are tender with just a little bite to them. The chutney seems too sweet, but that may be because the figs have awoken those taste buds a bit more than normal. The naan is wonderful. There’s just something about the taste of rosemary in the Fall that makes everything seem okay. The herby rosemary and savory sea salt balance each other beautifully, and the naan itself is soft and pillowy, with little crispy bits where the dough bubbles browned. I could eat a basket full of this as my entire meal and I’d be just fine. 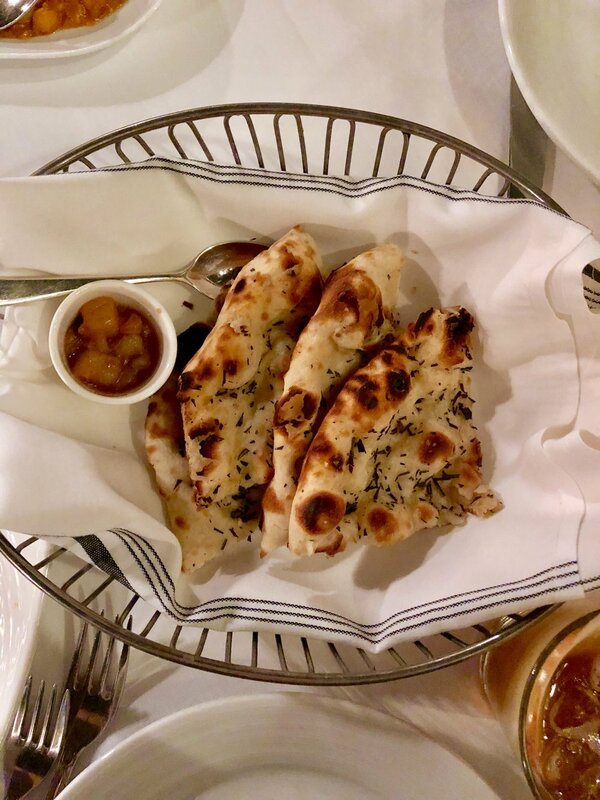 Rosemary and Sea Salt Naan at Ananda in Maple Lawn — Absolutely delicious! The reverie is short-lived, because out come our entrees. We went the traditional route with our order, selecting the murgh khumari (chicken in a creamy apricot and almond sauce) and the palak paneer (creamed spinach and homemade Indian cheese). There were more adventurous things on the menu, but we decided to try out some old standards. Unfortunately, we’re a little disappointed. Don’t get me wrong: The food isn’t bad, but it also doesn’t reach the bar set by the décor, the service, the cocktails, and that damn delicious bread. We’d expected the palak paneer to have more of a kick to it, but it tastes more like a side of creamed spinach you’d get at a steakhouse, with cubes of paneer in it. The chicken is … okay. Not bad, but not out of this world, either — I’d give it a six-point-five out of ten. We decide that we’ll come back another time and try some of those previously mentioned adventurous menu items, to see if things get kicked up a notch. Now it’s time for dessert. We have plenty of room left, since the entrée portions were rather small (we’d ordered the half-order of the paneer). We ask the server to help us decide between the Indian doughnut and the French toast. He very quickly tells us that the French toast is amazing, so we settle on that. Tastes like a cross between indulgent French toast and bread pudding. This dessert is like a cross between really rich French toast and an equally decadent bread pudding. I don’t know how they managed to keep it so moist on the inside, but crisp and caramelized on the outside. It’s served simply with a dollop of whipped cream and some strawberries, but that’s fine with us: The toast deserves the spotlight. As we weave our way back through the bar to leave the restaurant after our meal, I notice that the crowd has morphed from just-off-the-clock worker types to a trendier, more high-end mix. There’s even a bachelorette party going on in the corner. I definitely need to come back for Bliss Hour one of these days, maybe hit the tail end of it so I can see the transformation for myself. While some of the dishes didn’t hit any high notes for me, there’s potential there; and that, combined with the transportive ambience, tells me that I want to see what else Ananda has to offer.